As we move into the latter part of the fall marching band season, we’re faced with weather hazards that can do much damage to our instruments. It’s near the end of the season, so we can’t just escape inside to rehearse music if rain and very cold weather continues to hit during rehearsal times. Eventually, you have to go outside. There’s also the possibility of having to deal with these elements during a contest performance. Here are some tips to help make sure your instruments survive the elements this fall. Use covers as much as possible for your mallet instruments, especially when drill is a focus and the pit isn’t playing all the time. If raining during rehearsal, keep mallets dry and use old mallets if available. Keep your “show mallets” in good condition. Try to avoid too much water collecting on your drum heads and dump if needed. Keep tenor drums down in playing position and don’t allow the inside wood shells to get soaked if raining heavy. Keep stick tips and bass drum mallets dry. Use old sticks and mallets if possible. 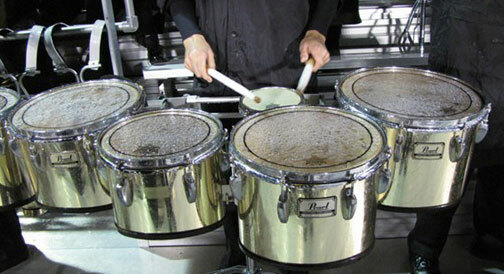 In very cold temperatures, be careful not to overplay cymbals as they are more susceptible to cracks. “Warming” a gong should always be done before striking it (lightly tapping it to get it vibrating) but this is even more important during cold temperatures to help avoid cracks. Cover electronics with tarps, trash bags or anything to keep them dry. Clear plastic can be used over electronic keyboards, leaving just enough room for the player’s hands, so the student can still see the keyboard and participate. Take covers off and lay out to dry. Use towels to soak up water that may have collected around the edges of drumheads or anywhere water may be hiding. Lay electronic cables out to dry. If any electronics may have gotten wet or damp, place a fan blowing on them to help get them dry as fast as possible. Make sure to dry EVERYTHING off (instruments, frames, hardware, etc) to avoid rust and other damage. We can’t always get the perfect weather during marching season and are sometimes forced into elements that are not ideal. Take the time to keep your instruments in good condition to avoid damage and costly replacements and repairs. Good luck the rest of the season! I like that you provided some tips for taking care of your marching band instruments such as covering electronics with tarps or anything that would help keep them dry. Some of your instruments may be prone to moisture if left unused for a period of time. Hence, it's recommended that you cover them with some protection to ensure that they are always in excellent condition. If I were to clean my own musical instrument, I would make sure to keep this in mind. Thanks.